Разработчик игры Lightfield Hyper Edition, игры которая зарелизилась! и пилилась в 4 лица командой из Вены несколько лет. Игра, только вышла, так что пока не ясно, как она себя покажет. Интервью на английском, но я не думаю, что у кого-то из вас могут быть с этим проблемы. Can you share some information on your professional background before game development career? My theoretical background is in computer science with a focus on rendering and graphics. I was always interested in game development and also during my studies I did a few game related projects. I was also quite active in the local game dev community and helped to organize over 15 game jams, many events and even a large game conference here in Vienna. How did you decide to become game designer? I don’t really know. I always had a strong interest in game design. I never had formal training in game design, because there were no courses available 10 years ago, but my background as a programmer also helps. It allows me try out design ideas myself and also to know what design ideas are possible from a technical perspective. Simon tell us about your experience in game development. How did your work correlate with your income? I did not go into game development to become rich quickly. I guess nobody does :D. I would probably earn more working a regular programmer job somewhere, but then I don’t get to do all the cool things I do now. Realizing our own projects and learning a lot during it also has a great value to us. And I also love working in our team. We are just 4 persons in our studio, and I really love going to work every day. At what stage did you join Lightfield Hyper Edition? The 4 of us were all in it from the start. It began about 4 years ago as a small weekend prototype that we then kept working on for some more weekends. We spent more and more time on it and about 2.5 years ago we finally founded our company, Lost in the Garden, and started the full production of the game. The first version of Lightfield was released on PS4 and Xbox late last year, and we have been working on the HYPER Edition ever since, to make it even larger and better. Tell us about the development team. How did the staff change over the course of development? Which hierarchical structure did you use? Since we are just a small 4 person team and studio, there was no change during the development. Having such a small size team means also that we don’t need any rigid structure and that everyone is on the same level. Every morning we have a brief meeting, where we discuss our current tasks, and there are longer design meetings if needed. We usually agree on everything together (which worked surprisingly well) but each of us also has a special area of expertise. For example, everyone of us contributed their ideas and vision to the game design, but It was my role in the end to make sure it is coherent and to keep an overview over everything. How did you organize the development process? Did you use Scrum/Agile or any other similar techniques? We use a very custom and very lightweight process that takes bits and pieces from Agile, Scrum and Kanban. We don’t follow any methodology rigidly (and you are doing it wrong if you are) and it also changed a lot during the project. During prototyping task management is quite loose, and for production we went with a kanban style approach to organise our tasks. We used a real board, but we also tried trello for bug tracking and are now using Asana to manage our sprints and tasks. The challenge is always to only have as little as possible without losing the overview and control over the project. We learned a lot about dependencies in our project and are now much better in identifying and resolving them early on. How do you make creative decisions? Who is ultimately responsible for the final decision? As I wrote above, we all take equal parts in making creative decisions, but each of us has certain authority of their area of expertise. It is only used as a last resort though, so that we don’t run into a deadlock. Raimund for example has authority over everything relating to the visual concept of the game. Julia decides on level design, production pipeline and planing, Matthias is responsible for everything technical and I make sure game design is coherent. Tell me about the stages of development. How many critical points of non-return did you have? What decisions do you regret? We started with a prototype that then evolved over time. At first it was only a few weekends, and the second stage was a 2 month period where we worked exclusively on a prototype. We then used this prototype to apply for a public development grant and to build or network. after receiving the grant, we founded our studio and started preproduction/prototyping for about a half a year. It was then followed by main production and polishing up to the initial release on PS4 and xbox. After that we had a period of maintenance and also started main production on all the new HYPER Edition features. My favorite question! Games are business or art? Where does this line go for you? The game designer and developer clearly says ART (just like music, movies or literature) but the reality is also that we have to maintain a business in order to be able to continue making artistic stuff. It is all about finding the right balance. With our games we tend to lean more to the art side, and we probably would not make our next game with feature X and Y just because we could earn more. Besides games, as a studio we also do contract work, working on smaller games for websites but also doing interactive installations and VR. This also helps us to balance business and art and also allows us to keep working on games that we love and want to make and not only making them for the sake of money. You and other developers will get a share upon the sale of company? The company is fully owned by the four of us and we each have an equal 25% share in the company. Do you imagine Lightfield Hyper Edition in VR? We are getting asked about that a lot :D. At some point Matthias made a very quick prototype so that we could try out what it feels like in VR. It was quite intense, but not nearly as bad as we thought it was. Taking the game from this quick test to a really good VR experience would mean a lot of work though. VR has matured a lot in the past, and simply having it also in VR is not enough any more. It would really have to be a good VR experience and that would probably require many changes in the game so that it is not just a gimick. Have you beeing thinking about eSports? What components should be added to the game to make it competitive? Yes, eSports is also on our radar. Being just a small team, we did not have the time to really focus on it yet, but we can definitely see the potential. I think Lightfield is great to play, but also exciting to watch. What’s probably missing in the game right now is a structure for leagues and matches and also a spectator mode. 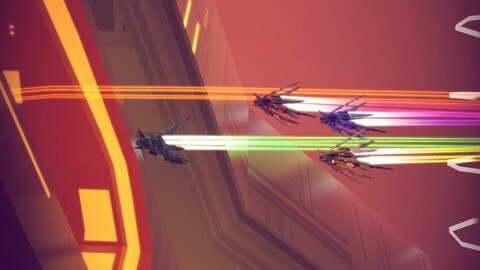 With Lightfield we really tried to push the racing genre forward. It might look like a standard futuristic racer, but the how you control and steer the ship is quite different. We managed to create a very unique combination of flying, driving and parkour that we haven’t seen anywhere else before. Не с такого интервью я планировал начать эту рубрику, но оно коррелирует с моей предыдущей заметкой и может быть полезна вам.